For more than 50 years, the Gibson and Kemp families have been growing apples at Algoma Orchards near Newcastle in Durham Region. Their apple roots go back much further than that, though, with the Gibsons growing apples since the mid to late 1800s and Kemps since the early 1900s. That kind of longevity comes with a commitment to sustainability that is at the core of everything Algoma Orchards does – sustainability of their land, soil, and air, and of their business, their customers, their suppliers and their employees. Algoma has 1,200 acres of orchard, where their four main varieties of Gala, Honeycrisp, Ambrosia and McIntosh account for two-thirds of their annual apple production. Their apples, and those they buy from other Ontario growers, are packed and sold to Loblaws, Walmart, Costco and Longos from their packing facility – about two million boxes of apples annually. Through their own juice plant they make cider under the President’s Choice label that is sold across Canada; other sweet cider customers include Sobeys, Metro, Walmart and Costco, and they also press juice for the Tropicana apple juice sold in cartons. Overall, according to Algoma’s President Kirk Kemp, the company produces between nine and 10 million litres of apple juice every year. Sustainable practices abound in every aspect of their business, in everything from how they manage their orchards to their juicing and apple packing facilities. “We have a milli on trees in the orchard that are scrubbing a pile of carbon out of the atmosphere every day,” says Kemp, adding that a consultant study completed several years ago when Algoma only had about two thirds as many apple trees as they do today showed the orchard removing the equivalent of 250 cars off the road daily. Trickle irrigation is used throughout the orchards instead of overhead watering, a system that drastically reduces water usage by applying the water to the soil where the tree can absorb it instead of spraying it overhead where large quantities are lost to evaporation. When it comes to crop protection, Algoma has been using an approach called Integrated Pest Management (IPM) for more than 30 years. This involves carefully monitoring the orchards for the presence or threat of pests and diseases and only treating trees when needed. To protect apples from frost damage, about 80 percent of Algoma’s orchards are covered by frost fans. The fans come on automatically once temperatures fall below a certain point and keep the air in the orchard circulating to prevent frost. When it comes to planting trees, Algoma has adopted the slender spindle system where trees are planted close together – about 1,100 trees per acre – and supported by a system of posts and wires, similar to wine grapes. This lets the trees put energy into producing fruit instead of developing a strong, thick trunk, resulting in new trees producing apples sooner and of better, more consistent quality. The more uniform tree shape makes pruning and harvesting easier and safer for workers, as well as enabling the use of technology like harvest platforms for picking. In their juicing and packing facility, Algoma has installed over 60,000 square feet of roof top solar panels that produce the equivalent of 55-60 percent of the operation’s average power demand when in use. And they’ve also just added some Tesla storage batteries that let them bring in power at night and store it for use during peak demand times. The roof top also has a water-catching system to capture rain water that is then stored underground and after treatment, used for cleaning in the plant. A sophisticated water filtration system means Algoma only needs to drain the water used in apple packing once per year instead of every couple of weeks. “We recycle all the water we use and use it for cleaning in the plant,” says Kemp, adding they also completed a sustainability course that President’s Choice was offering for its suppliers. And their efforts aren’t going unnoticed. Algoma was awarded the Minister’s Award for Environmental Excellence by the Ontario Ministry of the Environment in 2011, and received a “Water’s Next” award from Water Canada in 2012. 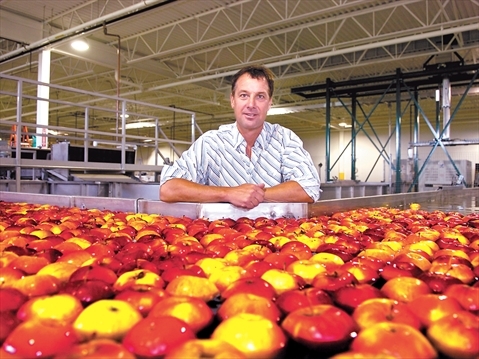 A Premier’s Award for Agri-Food Innovation Excellence in 2009 recognized their introduction of an image-based sorting system for apple grading. And just last year, Algoma received the President’s Choice Sustainability Award, which Kemp says was in recognition of many of the things they’re doing both on the farm and in their plant. Looking to the future, the plan is for continued growth of the multi-generation family business.